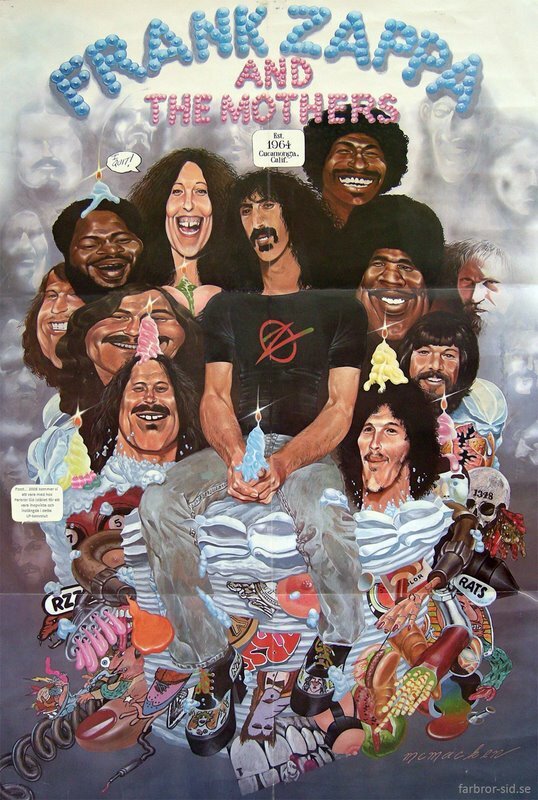 The original uploader Farbror Sid is not sure what Zappa album this poster, by Dave McMacken, came with. Anybody? I’ve been looking around on the web for a while and I can’t find this poster or any references to it. Maybe it’s very rare in real life too. I seems it’s a Mothers (of Invention?) jubilee and I’m counting six candles. Heh, well I was about to ask you guys, but one visit to the wiki identified the above as… a 1974 Christmas card. All hail The Mighty Wiki! The folding creases in the image however do suggest that this illustration was also printed in a poster format… and possibly shipped with an album? I believe it was a 1974 tour poster, not associated with any particular album. Ah, my favorite year for live Zappa! I like the “I Quit” blurb from Ruth. Nice candles burning on top of Chester’s and Bruce Fowler’s heads. Hey, BTW: I am still looking for a decent (best) resolution picture of Frank with You-know-her-all Claudia Cardinale. There are two versions of pics from that shooting, some reproductions of them as paintings on a wall in some cafe in CZ or Hungary but that’s it. Has someone a fine scan of that picture? I believe you refer to an old KUR Logo… But I could be wrong. Can’t make out the speech bubble shown on the lower left side of the poster, & it’s not in the Wiki picture…what does it say? hmm, cant tell but it is Jean Luc Ponty… dig the ghostly images of exMothers in the background. See how Don Preston is filled in? I’m thinking Roxy tour too. Also, 7 candles by my count. Hey, BTW: I am still looking for a decent (best) resolution picture of Frank with You-know-her-all Claudia Cardinale. Sorry, you guys are wrong. The candles represent the ’10th Anniversary’ designation/celebration. That’s why Zappa is saying “established in 1964”. 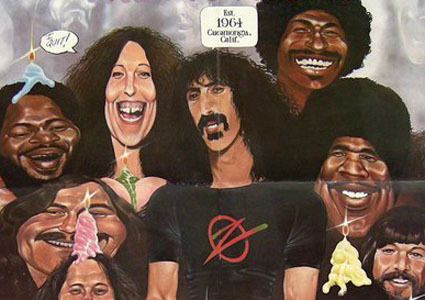 Pictured from left are: Chester, Tom Fowler, Bruce Fowler (just a little bit of little Bruce at the bottom lower left with the candle on his head), Ruth (with “two big teeth” saying “I Quit”), FZ, Napoleon, George Duke, and Ralphie “little feet” Humphrey at the lower bottom right. oops, i didn’t enlarge it, but you get the idea–if you do you see Simmons and Don Preston–all part of the short 10th anniversary tour. Ah, thanks Barry–now i see, my apologies! Out of curiousity (I was three years old back in ’74, pardon my ignorance): how was this “Anniversary tour book” issued/released? Was it one of those “had to be at the concert” sales — much the way a lot of stuff is sold exclusively at ZPZ venues? Oh but I, for one, am interested! Post away.